It's probably just nostalgia talking. I have no reason to expect that the line of Salvador Dali scents would be any better than any other nowadays. But I still have fond memories of the stunning eponymous scent that launched the line in 1983, and so my unreasonable assumption is that the line itself is good. Heck, not even Chanel and Guerlain are reliably good any more: why should some odd little collection named after a painter be? I think we can pinpoint when the Dali line jumped on the express elevator to hell, though. After the original scent, there was a men's version four years later which is strange and interesting: not particularly wearable by me, but strange-and-interesting is nothing to sneer at. A couple more scents spaced a few years apart, then the enchanting Dalissime in 1994 (at the time, a fruity floral done exactly right, although it might smell like anything almost twenty years and some presumed reformulations later) and the unabashedly pretty Eau de Dali in 1995. That was when they started dependably launching a scent a year, sometimes two, which is an unsupportable number if you want them to be consistently good. I haven't smelled them all, and perhaps some of them are terrific, although the odds are not in their favour, but I'll give them the benefit of the doubt. 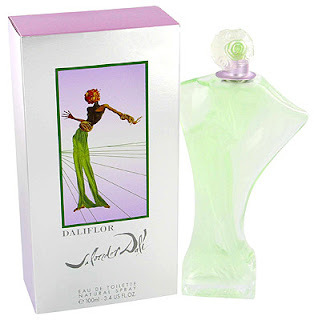 But sooner or later the line had to take a nose-dive into the inky depths of modern perfumery, and Daliflor in 2000 is the point at which we are teetering on the edge of the abyss. It's not a complete monstrosity: a damp citrus opening out into a big, rosy floral with a woody base. There is a lot of rose, which is always welcome: rose scents got a bad reputation in the last couple of decades, but since a rose is one of the best things in the world to smell like, there's always a place for something like this. Unfortunately, the whole composition is cheap-smelling, redolent of car air fresheners and laundry detergent. The bottle and box surely cost more than the liquid inside, and so the packaging is pretty much the only reason to buy something like this, unless you couldn't find another rose scent on the drugstore shelves or have just awoken from a coma and have never smelled a modern perfume before. But worse was to come: Dalistyle in 2002, at which point the line went straight to hell. This one is a complete monstrosity, a cheap, vulgar fruity floral heavily saturated with aquatic notes: wet pear and blackcurrant, indistinguishable sodden flowers, and presumably some sort of base to lay them all on, though I never did get that far. There's no denying that it's the sort of thing that was selling in the early 2000s; there's also no denying, though, that it is truly horrible, and what a depressing thought that there are so many things on the market that are just like this, and every one of them worthless. 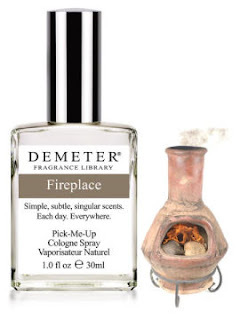 I think if you were willing to put in some time and energy, which unfortunately I am not (at least not right at the moment), you could make up a scatter plot graph of all Demeter scents on two axes, the X axis running from Accurate to Not Even Close and the Y axis going from This Is A Great Thing To Smell Like to WHAT THE HELL SERIOUSLY? Somewhere up at the top of the graph would be such oddities as Sushi and Lobster (which I have not smelled, so I can't judge their accuracy, but they are unquestionably what-the-hell scents), and over on the left would be amazingly precise and evocative things like Sticky Toffee Pudding. I think most of the desserts would be clustered down near the bottom, with varying degrees of accuracy, but I just cannot make up my mind about Apple Pie. It's reasonably accurate: it doesn't smell like you have a hot fresh pie under your nose, because it smells more like a collection of parts than a single unified whole. An apple pie smells like a thing of itself, but Apple Pie smells mostly of tart, slightly undercooked apples and cinnamon: there isn't much sugar in evidence, and I figure the pastry ought to make up at least a quarter of the scent but it doesn't really stand out. Still, even if this is mostly just a crisp apple-cinnamon scent, as sick as I am of the apple note that's appearing in every other scent to hit the market these days, I have to admit that it's kind of nice. Maybe it's just as well that Apple Pie doesn't smell especially accurate and pie-like, because I can't decide whether if apple pie is a genuinely strange thing to smell like, or if it's perfectly normal, no weirder than croquembouche, say, or a Creamsicle. But of course we might say that smelling like either of those things is odd, too. It's just that vanilla has been used in perfumery for a very long time, and since the explosion of the caramel-vanilla-honey-chocolate sugar bomb Angel onto the scene twenty years ago (twenty years ago! 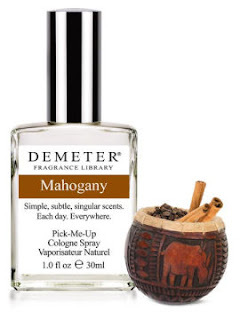 ), we have come to accept that very sweet, desserty things have their place in perfumery, so when Demeter sells Vanilla Ice Cream, Marshmallow, or Sugar Cookie, most of us don't even bat an eye. And yet I can't help thinking that a pie (they also do Pumpkin Pie) is somehow a whole different beast, and I can't even quite say why. It seems normal for me to wear a scent that smells of, say, ginger ale, but to wear one that smells like apple pie is not that far removed from wearing one that smells like a ham sandwich. I am aware that this doesn't make a lot of sense, that pie is just as much a dessert as brownies, and that my distinction is no distinction at all. But there you have it. Human beings are full of contradictions. 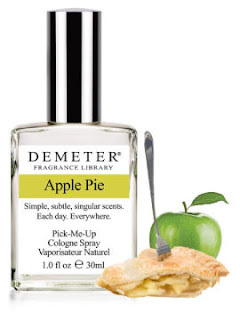 If you want to smell like mom's apple pie, or even a McDonald's apple pielet, then you are not going to get it out of this bottle, unfortunately. But if you want to smell crisp and fresh and apple-y, then this is a pretty good way to do it.